I have started to write this several times and I have come to realise that I really hate self-promotion, although this is more about how I got here than slapping myself on the back. But I am very happy and proud of how far I have come and what I hope to achieve. My story starts in 1971 the year I was born, and one day I plan to write it; but this is about life after Human Henge, so let’s start my story when I arrived in Wiltshire. I realised after moving to Trowbridge that mental health service were much worse than in the tiny village of Sherborn. Services were limited or miles away and I knew that something was needed and from my experience of mental health services I knew that it had to be service user led and ongoing. I tried to set to things with up with mental health agencies. I found not that they were resistant. it was more an issues of resources or they were more interested in services that provided projects that were geared either to returning to work or to what I refer to as basket weaving (projects are run for limited time offering no real structure). I never gave up on the idea of starting something but although I asked for help I could not get the support I needed. Time moved on some, and well I really had become isolated and needed something to give a reason to leave the house and interact with other human beings. This connection is the most important part of any project and it only comes when service users invest in a project. I mentioned about setting up a sort of project based around a magazine and the feedback was good and lots of people were interested but sadly the service provided only wanted a basic writing group that I could see would just become a basket weaving group. S I declined the offer to run it as I did not have the skills I believed were needed to make the project a success. After a change in care coordinator who had different knowledge I was introduced to the person in charge of service user involvement in the mental health trust. Just before Christmas we met once again to talk about a venue and thought about Tesco Community Room so we made some enquiries. We found out that we met the requirements to use the room but the person in charge of the diary was not available and would not be back till the New Year so we left our details and waited for a call. On the 11th January I got a call. Tesco had a cancellation and they had a four-hour slot on Monday and could we meet on the 12th outside Tesco. We met and agreed we would go for it for four-hours on a Monday, we walked and met with the person in charge of the room. Within minutes we had agreed to take the room on the coming Monday on a long-term basis and came up with the name Trowbridge Users Group (TUG). We agreed to starting group as a coffee and chat drop-in and let the group grow organically after finding out what people wanted. I thought it would be good to involve as many service providers as possible, not to run the group but to come in as guest speakers and say what they do and how they can help and how to access the service. This way service users could take a more active roll in their recovery. We all know that the mental health service across this country has been starved of resources and staff are under a deal of great stress and many service users are not informed about services available, so by inviting service providers users can take a proactive role in their recovery. 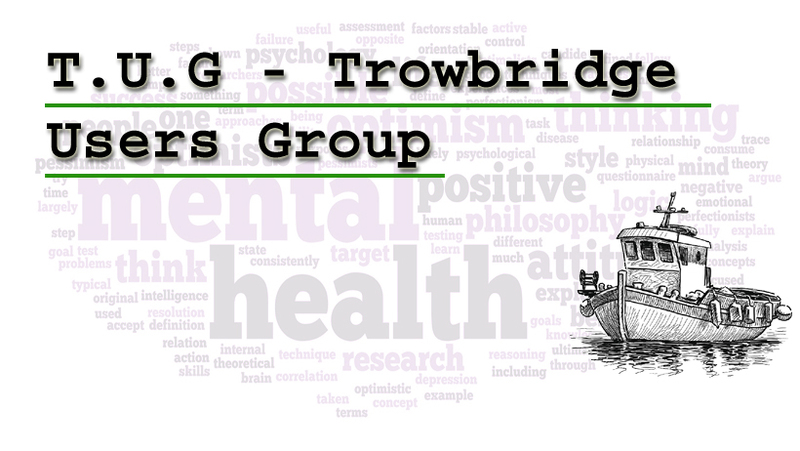 Trowbridge Users Group (TUG) has one main aim, which is to involve as many service users as possible and become a voice for change within mental health. We are actively encouraging service users to get involved in planning events and running on line services as FaceBook and Twitter Admin and as blog writers. We hope in time to have service users sharing their skills and business ideas and acting as mentors to others. The possibilities for this project are endless and one day I hope it becomes the gold standard for service user involvement and will shape mental health services so they are more service user led. This entry was posted in General on January 30, 2018 by Tasha Winton.